To the developer, an app that’s gone viral is one of the loftiest achievements that can be experienced. A viral app is one that users are eager to share across the internet through mediums such as social media, word-of-mouth, and email. It harnesses the power of the snowball effect, exponentially growing in size as people add to it’s sharing. It’s more economical and powerful than paid advertising as well. Virality is about interaction. It isn’t a marketing strategy as it’s not something that can be predicted. However, you can take steps to prep your app in ways that increase its likelihood to go viral. An internet definition applied to the term is: “The tendency of an image, video, or piece of information to be circulated rapidly and widely from one Internet user to another; the quality or fact of being viral”; and in regards to customer acquisition: “A phenomenon in which users acquire other users, usually through some referral mechanism built into the product on offer” (en.oxforddictionaries.com). The sharing aspect must be defined by something valuable. Users must believe that by sharing this particular thing they will gain some sort of praise or appreciation. Sharing and joining must be easy. People don’t have the patience or time of day for anything but. It should reward users for sharing. They’re the reason your business is relevant, thank them accordingly. Don’t let the app become stale. The more time one spends on the app, the more value and benefit they should reap. In the book, “The Lean Startup”, Eric Ries, the author, defines the “viral coefficient” as “how many new customers will use the product as a consequence of each new user who signs up.” His theory is that a coefficient greater than 1 will result in exponential growth whereas, a viral coefficient of less than 1 will lead to very little growth. These additional 200 users subsequently bring over 400 more users, so on and so on. But why exactly is this coefficient so important? It keeps money in your pocket while your user base is constantly on the rise. If your startup can maintain a coefficient above 1 then you can keep your marketing budget at bay as your users are organically taking care of that for you. 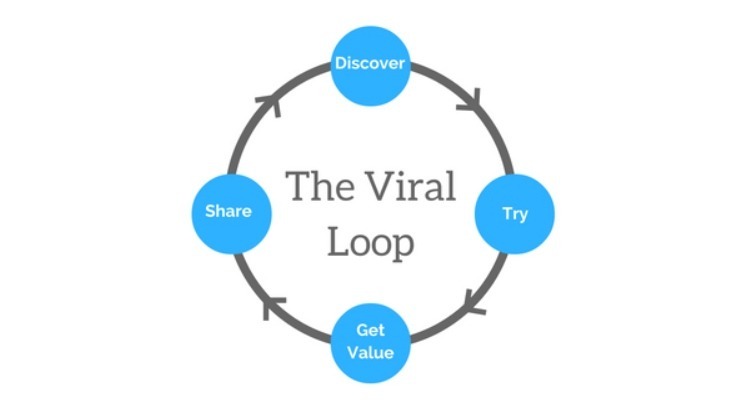 This concept of a couple of shares eventually resulting in thousands, growing your user-base exponentially is translated into this notion called “the viral loop”. Step 1: Investing in some initial traffic to get the ball rolling. Step 2: Building an engaging app that convinces users to keep using the app. Step 3: Provide incentives that allow these initial users to share the wonders this app contains seamlessly. The key to establishing this loop is the last step, offering a couple of features or rewards that get your users sharing. These incentives need to be valuable. The value should be substantial and immediate. The sharing process should be organic; users should genuinely want friends, family, colleagues to sign up and revel in the benefits. As I’ve mentioned before virality is not a marketing method. To understand this, it helps to compare the way a conventional marketing funnel works to that of a viral one. Traditional Funnel: Businesses dish out lots of cash via advertising in hopes that it will capture their target audiences attention and result in a download. Only a small portion of that traffic ever gets converted into actual users. The Viral Funnel: Compared to the structure of the traditional funnel, this one is flipped. Instead of a small portion converted from a large amount of traffic, a large portion of traffic is created by few through the organic sharing of an app. A new user putting his/her friend(s) on the product, suggesting that they try it. A referral code that a user can share to provide mutual benefit to the user and the potential new user. This is highly effective except if the business that offers this incentive is still budding it may bite into cash or profits too much. First and foremost, the app must engage. Include as many novels, pleasantly surprising, puzzle-like elements in your app as is feasible. There are many ways one can incorporate engaging elements into user-experience. Gamification is one that I will mention next but for more great ways on how to engage, check out this article. “Gamification” involves the inclusion of game-like elements which turn the user’s experience into one that involves a sense of accomplishment, and recognition, for completing a task successfully. When referring to investment, in this case, we’re not necessarily talking about monetary. Monetary is one way (in-app purchases) but were mainly talking about time, how much a user spends performing actions within the app specifically. There is this concept coined the “sunk costs trap” and it refers to the notion in which we become more attached to a certain product (app) or service, the more resources we allocate to it. For example, you’re way less likely to abandon a photo storing service such as Google Photos for a rival, if you’ve been using it for a couple years compared to just a few days. Organizing and transferring all those photos and albums across all devices would prove to be a huge hassle. Encouraging investment increases user retention and they are much more likely to share an app that they are heavily invested in, versus something they deem as disposable. Even though Virality is rare and can’t be predicted, it still often occurs within the app industry, a recent example is the game Pokemon Go. Your chances will grow if you set yourself up for success by implementing tips in this article. Good luck! App Analytics – What can you find out about your users?